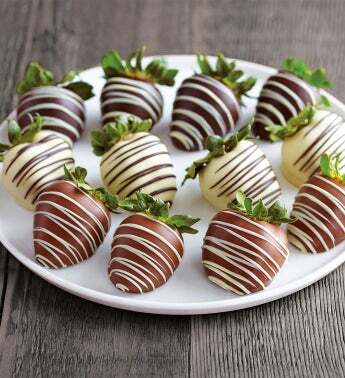 Strawberries are sweet, classic and perfect—especially when covered in chocolate. Individually hand-dipped in pure Belgian chocolate by a team of artisan chocolate specialists, these gourmet chocolate-covered strawberries are carefully crafted using only the freshest fruit and highest quality imported chocolate. Includes 12 strawberries dipped in silky dark, white, or milk chocolate and drizzled with more Belgian chocolate stringing.